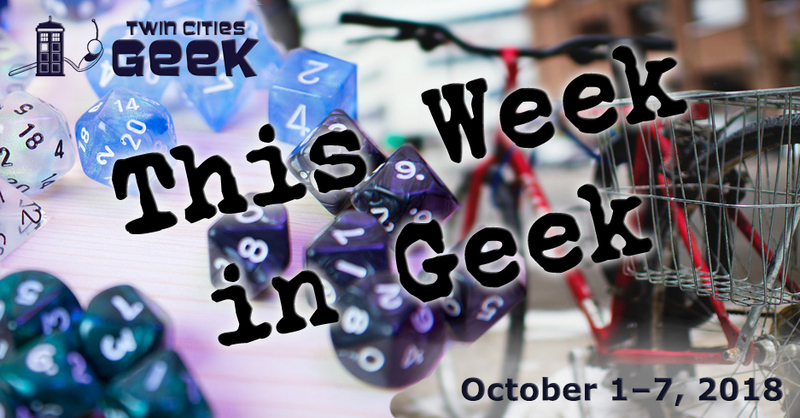 Welcome to This Week in Geek, your guide to events of interest to the Minnesota geek community for the week of Monday, October 1st to Sunday, October 7th. When: Monday, October 1st at 6:30 p.m. Celebrate 200 years of Mary Shelley’s landmark novel with a history of the greatest sci-fi monster of the modern age, as only Reverend Matt’s Monster Science can do. Follow the history of the Monster, from its origin as a dream-fueled invention of a badass teenage girl, up to its portrayal in modern pop culture. There will also be jokes and PowerPoint! When: Monday, October 1st and Tuesday, October 2nd at 7:00 p.m. and 8:45 p.m. When: Tuesday, October 2nd at 6:15 p.m. When: Tuesday, October 2nd at 7:00 p.m.
Test your knowledge of all things Harry Potter for a chance to visit The Wizarding World of Harry Potter in Orlando, Florida! This is a four-person team trivia event with a maximum of 45 teams per event, and a combination of your three best scores will be used to determine the winner, so this is a serious trivia event for teams who will be in for the long haul. When: Tuesday, October 2nd at 7:30 p.m., Wednesday, October 3rd at 7:30 p.m., Thursday, October 4th at 7:30 p.m., Friday, October 5th at 7:30 p.m., Saturday, October 6th at 1:00 p.m. and 7:30 p.m., and Sunday, October 7th at 1:00 p.m. and 7:30 p.m.
Minnesotan playwright Barbara Field penned this captivating retelling of Mary Shelley’s classic of science fiction to celebrate its 200th anniversary this year. This retelling focuses on the ethical limits of science and the human imagination as Dr. Frankenstein prepares to confront his creation in the Arctic Circle. Tickets start at $2. If you’re looking to plan more Frankenstein-related events, check out our article here. When: Tuesday, October 2nd at 7:30 p.m. When: Thursday, October 4th at 5:00 p.m. When: Thursday, October 4th at 7:00 p.m.
First Thursday Films at the Capri Theater—a screening and speaking series—will be showing the Through the Banks of the Red Cedar, a film showcasing the legacy of Gene Washington, an acclaimed sports legend and the director’s father. The film follows Mr. Washington’s tale as he moves from the segregated south to his time at MSU on the first fully integrated football team in America. The screening will be followed by a discussion with the director, Maya Washington. Tickets are $5. One-Shot Comics, a monthly comic series devoted to covering a diverse range of comics and graphic novels, returns with a discussion of Jeff Lemire’s Trillium, the tale of a late-38th century botanist and a famous early-20th century explorer, and a love that brings two souls together across the gap of space and time. One-Shot Comics strives toward the goals of “creating an inclusive space” and “perpetual awesomeness.” As usual, you can pick up a copy for 20% off at Moon Palace Books. When: Friday, October 5th at 6:00 p.m. The beloved podcast Welcome to Night Vale is on tour! Enjoy a live show of this geek-favorite podcast, which is returning to Minneapolis for a new live show, with special musical guest Mal Blum as “The Weather.” Come see why this is one of the most popular podcasts in the world! Tickets for this event start at $30. At this social event for cosplayers, costumers, and other crafters, you can “talk about how-to’s, where-do-you-get’s, and anything else cosplay/costuming, or just life in general.” Meet up, have a drink, and hit the dance floor. The gathering officially ends at 11:30, but you can stick around afterwards to dance and hang out. No cover if you show that you have RSVPed for this event. When: Saturday, October 6th at 10:00 a.m.
Fall ComiCon is an all-volunteer-run comics convention put on by the Midwest Comic Book Association, a local nonprofit devoted to promoting comic books, creators, and fandom. The event will feature guest creators including John Bivens, Andy Brase, W.C. “Cori” Carani, Otis Frampton, Ale Garza, Grant Gould, Rich Larson, Tom Nguyen, and Doug Paskiewicz. Admission is $10, or $1 off with a nonperishable food donation, and look for Twin Cities Geek there! Flip Phone presents a day of bar (or broom, or vacuum) crawling throughout Minneapolis. Celebrate one of the witchiest films straight out of the childhoods of many millennials, and enjoy drink specials, drag and burlesque, team-based competitions, and costumes, with 10 percent of the proceeds going to support Outfront Minnesota. This event starts fairly early, and will have events running throughout the day, followed by an after-party at the Saloon. Tickets run from $20–40. When: Saturday, October 6th at 11:00 a.m. and Sunday, October 7th at 12:00 p.m. This festival provides exposure and education regarding American Indian art, history, music, culture, and contemporary experiences. Art can open the door to connection and understanding on a human level, and this festival allows you to take part in workshops, take in a variety of performances, see the work of featured artists like Karen Savage-Blue (of Duluth), Brian Dow, and more. When: Saturday, October 6th at 4:00 p.m.
It’s an away mission to places with booze for the Star Trek bar crawl! Come in uniform (but please remember to not violate the Prime Directive) and bring an ID. This is a free, ticketless event, but given that these are bars, you’ll need an ID to get access to Romulan Ale (or whatever hipstery IPA the early-21st century inhabitants of these bars have on hand). Costumes from all eras are welcome, and the night will end with a big concert from Trekker-band Fistful of Datas. See the event’s Facebook listing for the full schedule and details. When: Saturday, October 6th at 6:30 p.m.
Come together for a good cause, and enjoy an evening of costume and community to support research and awareness of the fight against stigma for body-focused repetitive behaviors, like skin and hair pulling. Come dressed to impress as your favorite superhero, and enjoy tapas-style apps, and great company. Tickets are $45 for general admission. When: Sunday, October 7th at 10:00 a.m.
Anime Twin Cities and Geek Partnership Society are coming together for a screening of two family-friendly anime films, with a kids costume contest to break it up in the middle! Admission is free, and both films will be dubbed in English (so if your little ones prefer subs over dubs, make sure to let them know what to expect). The films being screened will be Oblivion Island, a movie about an entire island of lost things and magic, and Mary and the Witch’s Flower, a movie about a mysterious flower that allows Mary to turn into a witch for one night. This event is family and sensory friendly. When: Sunday, October 7th at 12:00 p.m.